This raw ginger orange cranberry relish is the perfect accompaniment to any holiday party as a condiment, appetizer ingredient or just a wonderful addition to a fall or winter feast. Spread it on crackers with some cream cheese or shaved parmesan for an easy tasty appetizer. Serve it with a ham or turkey over the holidays in place of traditional cranberry sauce for a change. It’s raw, it’s fresh and will excite your palate with a fresh, zesty and slightly sweet cranberry flair. I have never been a fan of traditional cooked cranberry sauce; that might only be because I’ve never had a really good one. In any case, cranberry sauce is just not something I’ve ever tried to mimick since it didn’t appeal to me. Raw seems to be the way to go for those of you like me who have never been excited about cooked cranberry sauce. Years ago I discovered Trader Joe’s orange cranberry relish and loved it so much I wanted to duplicate it. I never tried till now. Now, I must say I prefer this recipe because it’s got a fresh flavor, less sugar and well the ginger just takes it to another level of wow! My readers know I love my fresh ginger! If you love the zest and fresh earthy flavor of ginger like I do you must try this recipe with fresh ginger root only. Powdered ginger will simply not have the same effect. Go fully raw and fresh on this recipe and you’ll be sure to love it! This is a raw cranberry relish. No cooking, no huge prep, easy and delicious! Enjoy for up to 1 week refrigerated. 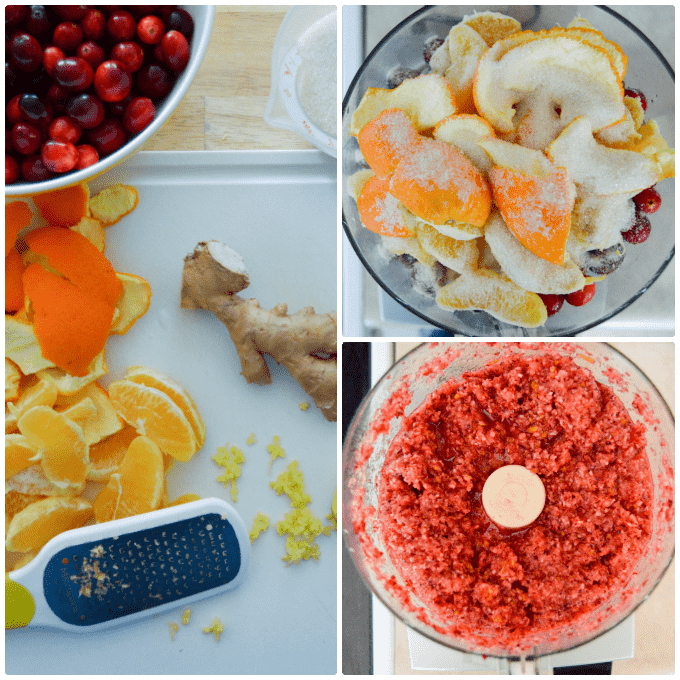 Simply add all ingredients to your food processor and pulse until you get a small chunky relish type consistency, making sure all of your rind and cranberries are processed. Chill the relish in the refrigerator about an hour and then enjoy! Try this relish on crackers with cream cheese or a sliver of parmesan. Also great in place of cranberry sauce on the side of ham or turkey. Try it on sandwiches for a delicious sweet and zesty change.